[SatNews] Both models are built of hot dipped galvanized steel, well suited to the tropical weather of the Philippines. Jampro Antennas of Sacramento, California, was recently awarded three antenna systems contracts by the Solar Entertainment Corporation of Mandaluyong City, Philippines. The order included new VHF antenna systems for tower sites supporting Solar’s Channels 5, 6 and 7 located in the cities of Cebu and Davao. For Channel 5 in Cebu and Channel 6 in Davao, Solar Entertainment ordered the JHD-LV2 VHF antennas for each site along with rigid transmission line, and Rigid Line Kits. For Channel 7 in Davao, a JHD-HV4 VHF antenna was specified along with dual runs of rigid transmission line, an RCPU power splitter/patch panel system, and Rigid Line Kits. The JHD-LV2 antenna is a half-wave spaced, dual horizontally polarized dipole flat panel antenna system with a pressurized feed system designed for Low Band VHF Channels 2 through 6, Band I covering 54 to 88 MHz. 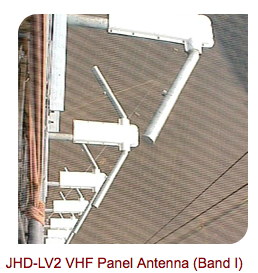 The JHD-HV4 antenna is also a half wave spaced dual horizon­tally polarized dipole flat panel antenna system with pressurized feed, but engineered for high band VHF for Channels 7 through 13 on Band III at 174 to 230 MHz. Both JHD models are built of hot dipped galvanized steel, well suited to the tropical weather of the Philippines. These antennas have proven to have excellent bandwidth with typical VSWR. Many omni-directional and custom directional patterns are available to Solar Entertainment to custom fit their coverage objectives for each city. Solar Entertainment Corporation is a Philippines-based media company with 6 cable channels, 4 Free-TV Channels (RPN, SBN, RJTV, and BEAM TV) and a film distribution company.